Doors open at 6:30; bell at 8. Advance tickets for adults are $7. At the door, they are $8. Kids get in for $4. For information, call (314) 776-4833. Also in action: Bum Rush Brothers, Mike Sydal. 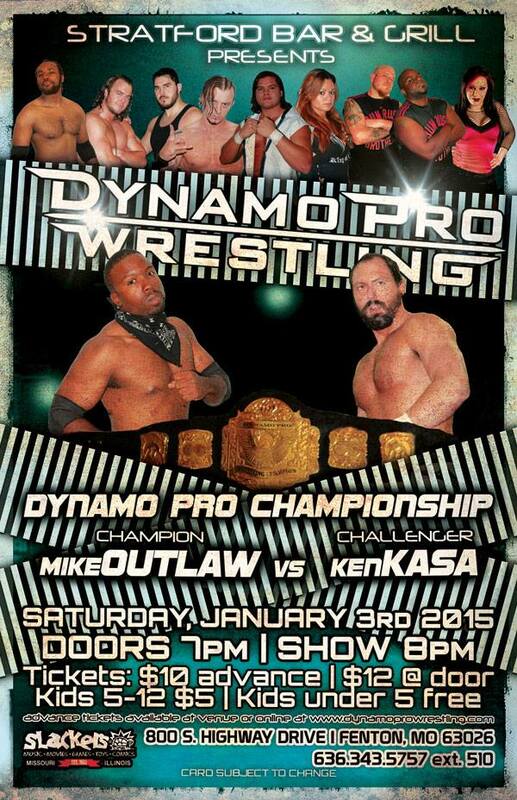 Ticket are available at DynamoProWrestling.com or at the Stratford Bar & Grill in advance for $10. Tickets are $12 at the door. Doors open at 7; bell at 8. 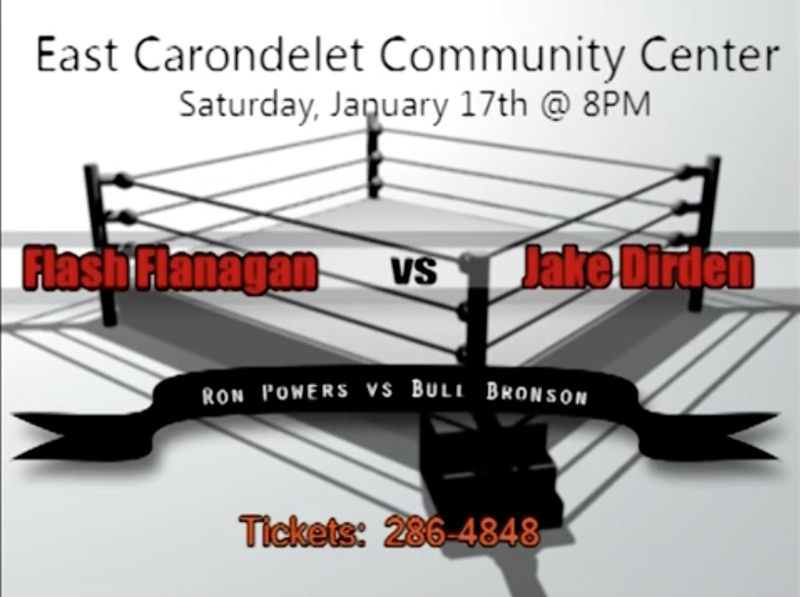 In the world of independent wrestling, the name Castaldi doesn’t ring too many bells. But in 1975, that young man (then known as “The Hitman”) began his career in the Midwest. 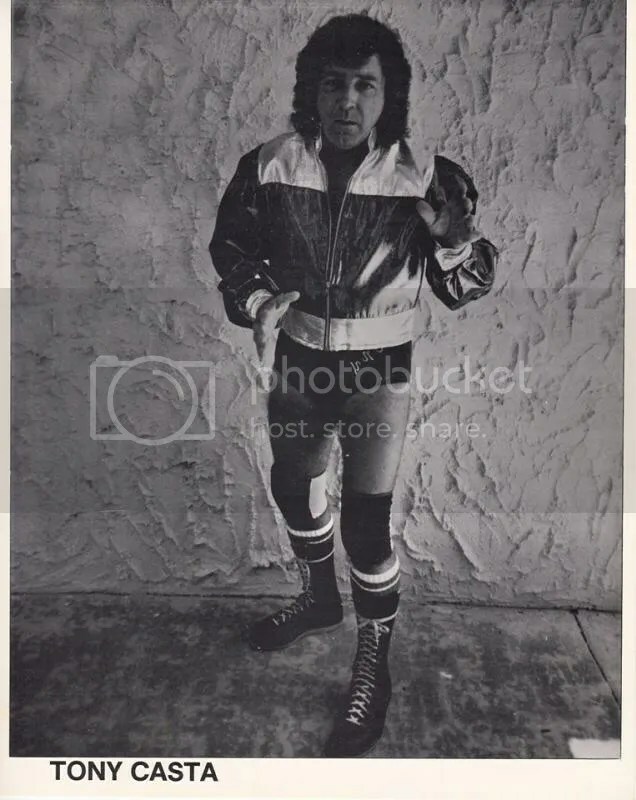 Competing under a mask, the newcomer evolved through training and added several matches to his resumé before re-inventing into Tony “Little Dynamite” Casta. 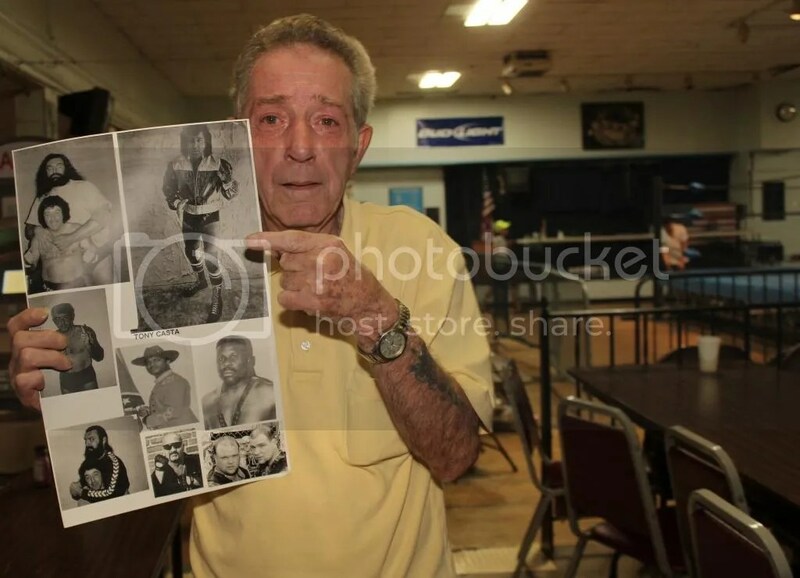 He became a decorated wrestler in the Mid-Missouri Wrestling Alliance, which the fans in South St. Louis recognize as the MMWA at the South Broadway Athletic Club in Soulard. 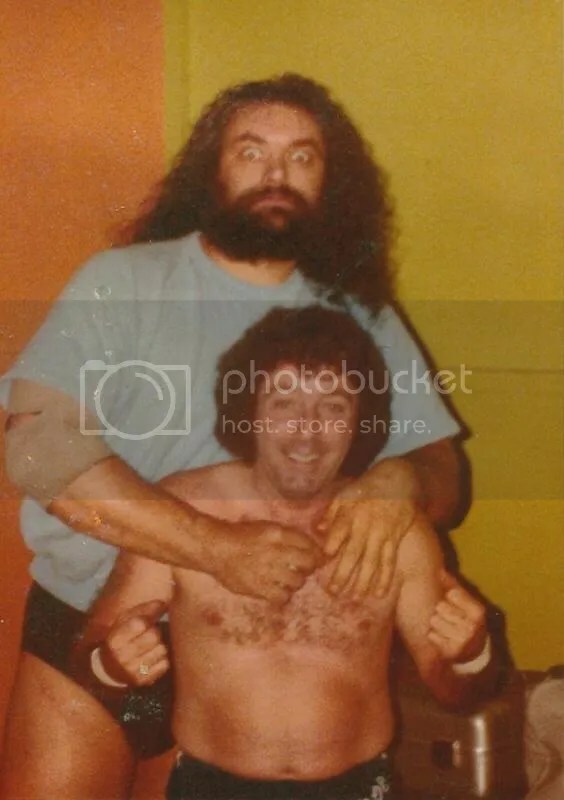 Casta (bottom) with Bruiser Brody. 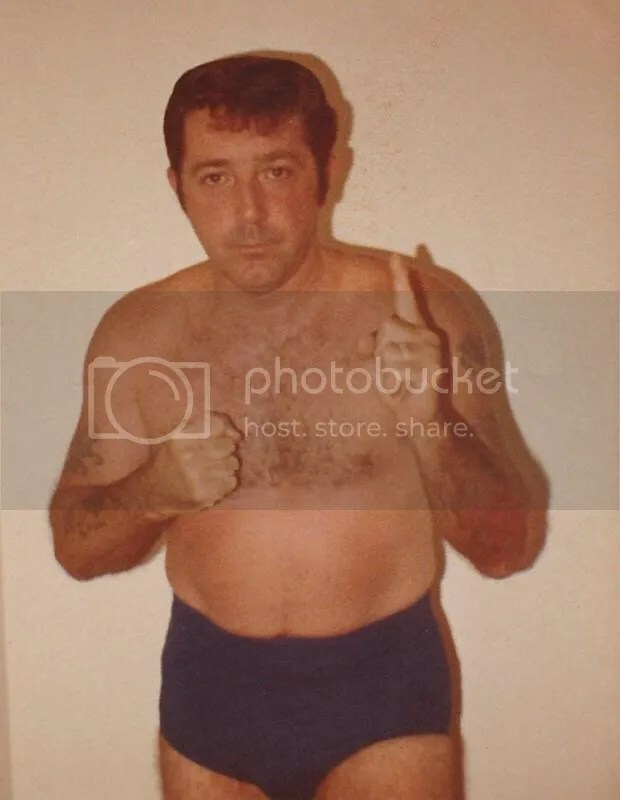 Casta worked with many of the greats, including Bruiser Brody, Tojo Yamamoto, Spike Huber, Ox Baker, Buddy Roberts, Iceman King Parsons, “Crusher” Blackwell, Chris Adams, Bob Orton, Scott Casey, Gypsy Joe, Professor Toru Tanaka and Mike & Pat Kelly. Among his many accomplishments was the opportunity to serve as referee for a match involving former World Heavyweight Champion Lou Thesz. Not confined to singles competition, Casta also competed as a tag team with the legend Ed Smith, who had worked as a referee and wrestler in Sam Muchnick’s St. Louis Wrestling Club. The pair captured the MMWA Tag Team Championship on two separate occasions. Notably, Casta held the MMWA Junior Heavyweight Title seven times. In the late 80’s, Casta suffered an AC separation that sidelined him for six months. He retired and became the SBAC’s wrestling promoter. From 1985-2012, he teamed up with Herb Simmons, creating the partnership known as MMWA-SICW. The two had spent years in Missouri and Illinois, working with the legends from Wrestling at the Chase, as well as independent wresters such as: Giant Assassin, Big Daddy, Ron Powers, Gary Jackson, Freedom Rider, the Masked Executioners, John Blackheart, Tom Sullivan, Dr. Blood, Keith Smith, and Chaz Wesson. Casta continues to lead MMWA Wrestling, filled with hungry talents who must learn to walk before they fly. The MMWA has seen everything from a young Randy Orton working his way toward WWE, to Ted DiBiase recording a taping of the history of Wrestling at the Chase in the promotion’s training annex. From his days training in the back room of the SBAC to helping hone and showcase the talent of outstanding local wrestlers, Casta has cemented his legacy as a true Midwest legend. He has shown his big heart for local youth and special needs organizations. Tony works hard to make a difference in the community. His wife of 38 years, Wanda, and his nephew, Anthony, are always supporting him. After all these years, the fans do too. 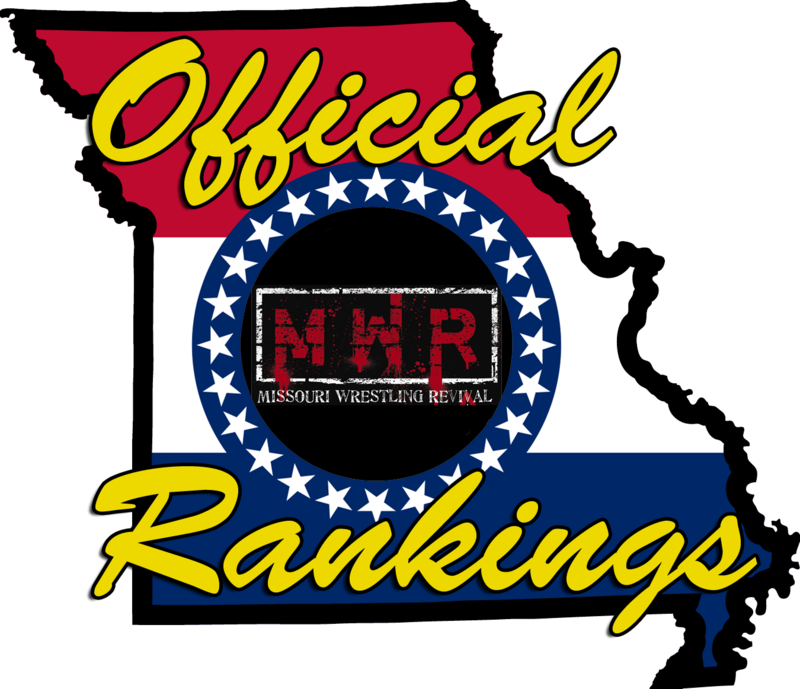 Now, as promised, a special comment about the Mid-Missouri Wrestling Alliance’s December 6th event at the South Broadway Athletic Club in St. Louis. It’s an old cliché but it’s true; there’s no substitute for being at a live event. Watching the video is one thing, but the live atmosphere is a lot of fun. 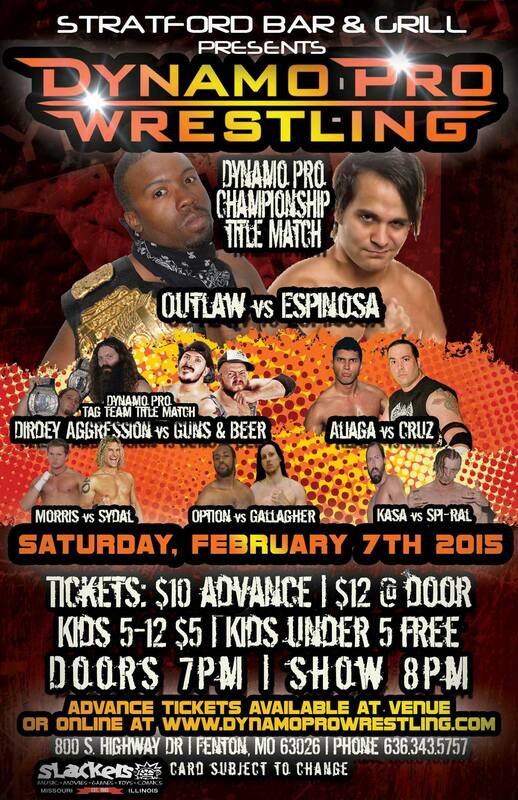 I recommend that any wrestling fan attend at least one independent wrestling card just for that experience. Wrestling fans in general are a unique kind of people and that especially holds true on the indy level. I couldn’t judge the attendance from the online video, but the people were making plenty of noise. Of note, there was a VERY loud group of supporters for Kevin Lee Davidson. I’ll keep this to more general commentary as opposed to a blow-by-blow. Your ring announcer was Ben Simon. Your referees were Nick Ridenour and Brian Stoltz. 10-Man Royal Rumble For the MMWA Survivor Title: This was the first time in a while that the former Battle Royal Title had been defended in a battle royal format. Brian James had to fight through multiple opponents to retain his title. The random draw put him in the #1 slot. Jimmy D (fresh off his suspension) was #2 but he was eliminated quickly…after that, there were no more eliminations until the final competitor (Kevin Lee Davidson) had entered the ring. The remaining entrants, in order: Laurence Johnson, Sean Orleans (who spent most of the match taking cheapshots and hiding behind his stablemates), Jacko (formerly Jackson Whitechapel), Barackus, Dave Osborne, Tag Team Champion Andrew Wilder, Tag Team Champion Johnathan Zulu, and Davidson. Davidson immediately made an impact by eliminating both tag champs at the same time. Barackus eliminated Johnson, but J’Mal Swagg distracted the big man and he stepped over the top rope to go after him (thus eliminating himself). Davidson and Orleans double-teamed and eliminated Osborne, then Jacko tossed Orleans and Davidson tossed Jacko in rapid succession. Both James and Davidson went over the top rope at roughly the same time; from my video’s vantage point, it looked like Davidson’s feet hit the floor first so James was indeed the rightful winner. 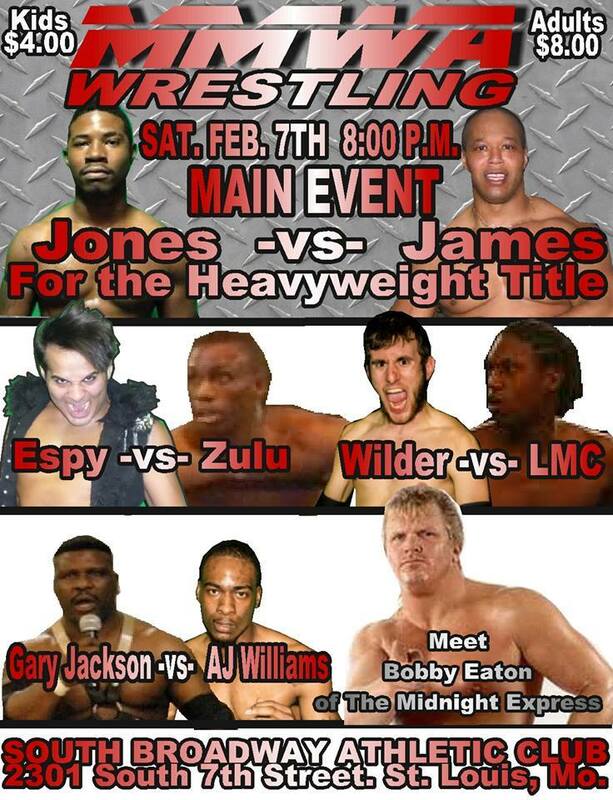 Barackus vs. J’Mal Swagg: The two were still fighting after Barackus’s elimination from the Rumble, so Jim Harris decided to just start the singles match. This was more competitive than I was expecting as Swagg was able to take out the leg on a few occasions. J’Mal was able to escape Barackus’s clawhold Flatliner a few times due to the leg damage, but the big man finally hit his move for the win. Andrew Wilder & Johnathon Zulu vs. Draco Verdadero & Flaming Freddie Fury for the Tag Team Title: Draco looked distinctly…darker than usual. This wasn’t set up to be too competitive and it lived up to that standard…a Stunner/inverted neckbreaker combo led to Wilder pinning Fury for the win. Team Harris vs. Team Orleans: Sean Orleans became Commissioner after The Elitism won a gauntlet match earlier in the year, but promoter Tony Casta named former Commissioner Jim Harris as “Co-Commissioner” to balance out the matchmaking power. Of course, they were not on the same page…to be more accurate, they were in completely different libraries. As a result, this match was set up to decide who would become the lone Commissioner of the MMWA. I’ve seen quite a few elimination tag matches lately, including one at Dynamo in October as well as WWE’s Survivor Series…always been a fan of the format. I still don’t get Jackson Whitechapel’s persona change to Jacko (a clown), but the fans seem to like it and that’s what counts. He eliminated Sean Orleans out of nowhere, only to eat a superkick from A.J. Williams to re-even the sides. A blind tag allowed Laurence Johnson to clothesline Everett Connors from behind, scoring a fall on the Junior Heavyweight Champion and continuing their feud. Brian James was the next to go; he already went through a tough contest earlier in the night and the numbers caught up to him. A Davidson spinebuster set up a Macho Elbow from A.J. for the three-count, leaving Da’Marius Jones and Dave Osborne against four Elitism members. Osborne is taking a break from wrestling and he went out with a bang, single-handedly turning the tide for his team. He pinned A.J. after a spinebuster, then delivered an impressive cobra clutch suplex on Kevin Lee Davidson to beat the new TV Champ. Johnson was the next to go after a swinging uranage backbreaker…but Espinosa cut off the momentum with his jumping DDT to eliminate Big Dave. That left Da’Marius and Espinosa and the two had a really good ten-minute match-within-a-match. A.J. stuck his nose into the proceedings again in an attempt to screw over his former tag team partner, but it was not to be. Espinosa went to the top rope to finish, but Da’Marius caught him with a mid-air Paydirt for the final win! Espinosa was unusually respectful and offered Jones a title shot…but Jim Harris noted that Gary Jackson had already been promised a title shot. 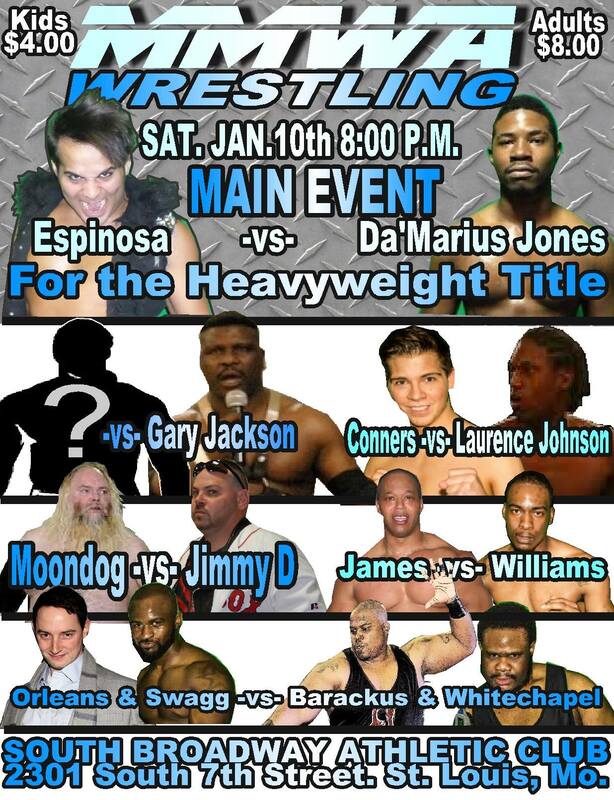 In an effort to kill two birds with one stone, Harris decided that Espinosa would defend against Da’Marius in January…then the winner of that match would defend against Gary later that night. No word on whether Gary will face “suitable competition” before his championship match (à la WrestleMania X). On other blog, checkout dallas immigration lawyers.